(SEOUL=Yonhap News) New foreign direct investment (FDI) pledged to South Korea in the first half of this year reached an all-time high, in line with rising interest in the nation's high-tech industries and startups in emerging sectors, government data showed Wednesday. South Korea received US$15.75 billion worth of FDI commitments from January to June, which represents a 64.2 percent spike from a year earlier, according to the Ministry of Trade, Industry and Energy. The actual investment made by foreign companies over the period reached $9.46 billion, jumping 76.4 percent from a year earlier, the ministry said. 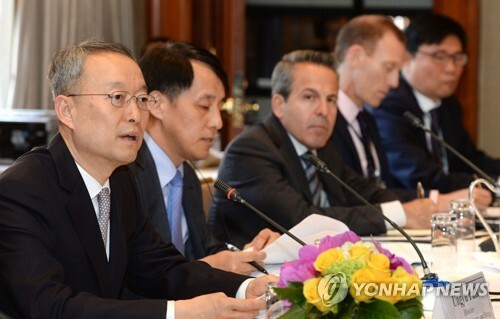 "The record-high FDI pledges reaffirmed the South Korean economy's strong fundamentals under a difficult business environment, including trade disputes between the United States and China as well as U.S. corporate tax cuts and interest rate hike," the ministry said in a release. The investment pledge from the European Union more than doubled to $4.57 billion in the first half, mostly in the form of joint venture for the global value chain and merger and acquisition. American companies sought partnership and stake acquisition in high-tech industries and tech startups, pledging $3.01 billion over the period, a 23.2 percent increase. New FDI pledged from China rose a whopping 350 percent to $2.2 billion, the largest-ever amount, led by brisk investment in the service industry. By sector, the manufacturing industry drew in $7.21 billion worth of investment pledges as offshore investors sought joint venture partners in the driverless car, drone and bio sectors. Service industries attracted $8.37 billion of new investment from abroad in emerging technology fields, such as e-commerce, cloud computing, mobile platforms and fintech, the ministry said.